We have both L/W and B/W females (x3) and males(x3) available. Dam: Upland Meadows Skys The Limit “Remme” is a medium framed black & white field bred Springer Spaniel. She is out of a second breeding of Upland’s Lighthouse Mia x FC Harvest Moon’s Quick Draw “Emmett.” The first breeding produced athletic talented pups with a great combination of drive and biddability, so we decided to repeat the breeding. We keep one female from each breeding. Three of “Remme”s brothers have received placements in field trials. “Remme” is a flashy athletic dog with the drive and talent you would expect from her pedigree, but also an exceptional temperament. She is a stable happy dog that takes everything in stride. She has a great off switch and is very calm and quiet while in her crate or the home. She loves everyone whether two or four legged. Notable dogs in her pedigree include NFC FC AFC Harvest Moon’s Cinnamon Girl, NAFC FC AFC Sand Creek’s Annie’s Abbey, NFC FC AFC Crosswinds Warpath, NFC FC Pondsview’s Left In The Light, FC Harvest Moon’s Quick Draw, FC CFC Lighthouse Drive Me To Drink, FC Spiked Moon Pie, and FC Amelda of Green Island. 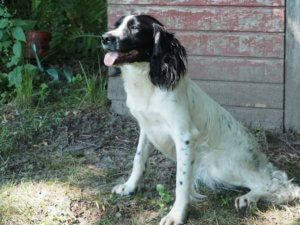 Sire: PrairieRose’s Jetstreaming Pepper is a large (55lbs) powerful black & white spaniel. Pepper has an exceptional combination of being a very powerfully running male with a great deal of drive, while also being very biddable. 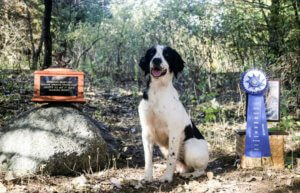 He is a great bird finder and driven retriever who has a perfect delivery. He is smart and takes to training quickly. Pepper matured early and began running on the field trial circuit at sixteen months, winning his first trial at just two years old. Pepper’s breeding is an intelligent blending of top North American field trial lines with some of the best field trial lines from the UK. This blending should produce exceptionally talented pups who are biddable cooperative hunting partners or field trial competitors. Notables in Pepper’s pedigree include FC AFC Kantagee’s Master of Lightning, FC AFC Paragon’s Bratach Bhan Macoid of Hellfire, FC AFC Milan Lynch’s Buccleuchs MH, 2x NAFC AFC Beggarbush Clipper, FC Wise River’s Put Me in Coach, FC AFC CFC Abitt’s Highlanders Lord MH, UK FTCH Clarburgh Art, and Buccleuch Favor (sister to 2x ENFC Annickview Breeze). Shipping is available at the buyer’s expense within the continental US on Delta airlines, direct flights only.